These many years, Stemm has been developing new products and techniques for dredging at big marine depths. The system and techniques used by Stemm are an alternative to traditional orange peel grabs, are innovative and have several registered patents. These underwater grabs, used for dredging from 100 m. onwards, have been installed in STORNES ships equipped with Stemm grabs combined with peripheral vision and lightning equipment. Stemm grabs allow a very exact position control system, and cause a very limited turbidity, vital to the potential sensitive marine environment, such as coral. Each grab has an automatic autocorrecting positioning system on the marine seabed. Today, gas and oil are being extracted from isolated fields in deep water. This equipment is a worthwhile solution, both for preparing the bases to install coastal pipes, or to extract big rocks and breakwaters when constructing new ports. Stemm’s grabs have already been used in deep applications in Australia and Norway, taking care of the excavation of thousands of cubic metres of hard and soft soil. The expertise of Stemm includes design and implementation. It has been involved in significant projects. such as Maasvlakte 2 in Rotterdam, eolic parks in Belwind (Belgium) and Teesside (United Kingdom). Stemm took part at the significant project of civil work for Palm Islands, a set of the three biggest islands in the world with a palm shape such as: Palm Jumeirah, Palm Deira y Palm Jebel Ali, located in Dubai (United Arab Emirates). Docks and breakwaters were built with an important underwater dredging task. The new Moroccan Port of Safi, where a coal terminal is under construction to receive 3,5 million ton/year, has a dike of 2,3 km. When the port was almost finished, a routine control detected cracking on the submarine foundations of the docks, which implies the reconstruction of a very important part of it. The constructor company, Turkish-Moroccan group SGTM/STFA has purchased the most up-to-date hydraulic grabs, in order to drive forward an adequate working rhythm and efficiency. They are working at full capacity to try compensating the delay on the works execution deadlines. 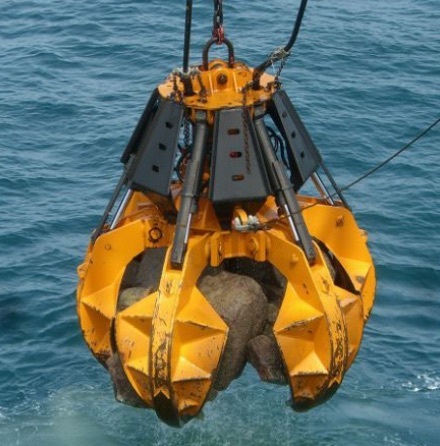 With Stemm’s grabs the depth of water is being increased, important rocks are being extracted, in some cases as much as 30 Tons.